Bob Geldof performs on Ark Royal The Rock Show - 26th October 1986. January - At sea for 909 and ADAWS trials. February - Visit to Amsterdam. 20th February - Operational Date Material Assessment. 24th February - Commence Basic Operation Sea Training (BOST) at Portland. 20th March - Final Thursday War - BOST complete. 21st March - Portsmouth. Easter leave commences. 7th April - Day at sea for live broadcast of BBC's Pebble Mill at 1, guest Samantha Fox. Radio 2 presenters including Ken Bruce, Jimmy Young and Gloria Hunniford also broadcast their shows live from the ship off the Isle of Wight. 8th April - Private visit by Her Majesty Queen Elizabeth the Queen Mother. 9th - 22nd April - At sea for Air Group Work Up. 23rd April - Operational Readiness Inspection. 24th April - Portsmouth. Commence Base-Assisted Maintenance Period (to include fitting of the ship's Vulcan Phalanx weapons systems). Summer leave commences. May - BAMP and Summer Leave. 2nd - 6th June - At sea. Shakedown. 6th June - Portsmouth. Preparations for deployment. 17th June - Sail for WESTLANT deployment. 19th - 27th June - Exercise LIBERTY TRAIN. 28th June - Arrive New York City. 2nd July - Sail from New York to regroup with escorts. 3rd July - Ceremonial re-entry into New York Harbour as part of an international fleet. Anchor. 4th July - International Fleet Review and official re-opening of the Statue of Liberty by President Ronald Reagan. 9th July - Depart from New York. 10th - 21st July - Anti-submarine warfare exercises. 23rd - 30th July - Visit to Fort Lauderdale, Florida for Short Maintenance Period (SMP) and station leave. 31st July - Commence trials at the AUTEC Ranges, Andros Island, Bahamas. 7th August - Trials at AUTEC Ranges complete. 9th - 15th August - Visit to Norfolk, Virginia. 15th - 29th August - Exercise NORTHERN ENGAGEMENT. 29th August - Exercise NORTHERN WEDDING commences. 19th September - Exercise NORTHERN WEDDING ends. 22nd - 26th September - Visit to Amsterdam. 27th September - Portsmouth for Short Maintenance period. 13th October - Sail from Portsmouth. 13th - 23rd October - Exercise AUTUMN TRAIN. 23rd October - Arrive in Gibraltar to prepare ship for the Rock Show. 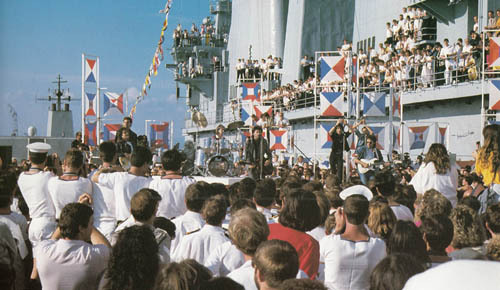 26th October - Recording of Ark Royal The Rock Show on the flight deck. Stars performing on board are Cyndi Lauper, Alison Moyet, Bob Geldof and Paul Young. 27th October - Sail from Gibraltar. 30th October - Arrive in Lisbon for informal visit and embarkation of Dutch marines. 3rd November - Depart Lisbon. 3rd - 13th November - Exercise HIGH TIDE. 14th - 19th November - Informal visit to Hamburg. 20th November - Portsmouth for maintence period and Christmas leave. 25th December - Broadcast of Ark Royal The Rock Show on ITV.